Pizza isn't something you'll see very often on this blog. Don't get me wrong. I eat plenty of it. But this is Orange County, not Chicago or New York. Pho, tacos, and ramen we got in spades -- just as good as those served in in Vietnam, Mexico and Japan, some might say. But pizza? So far, what I've found fits into the lowest common denominator. Most are harmless, serviceable at best, but for me, not worth writing about**. That is, until I saw a pizza topped with avocado. And I don't mean layered on top raw and after-the-fact a la California Pizza Kitchen. No, these were baked on the pie itself, along with the cheese and crust. If you don't find this strange, consider this: The California Avocado Commission -- the marketing organization representing California's avocado growers -- has a recipe for California Avocado Pizza Pie that explicitly instructs the reader to leave out the avocado until the pizza is fully cooked. Who would dare defy the CAC? Stonefire Grill that's who, although it is unclear if they pioneered the idea. When it replaced the quietly fading Hof's Hut nearly two years ago, I barely blinked. Yet another bland, over-priced chain, I thought. Compounding my prejudice was the fact that I've been burned by the likes of it before -- upstart fast-casuals peddling to the overworked with the promise of "home-made food", but serving nothing more than boring barbecue, limp pizza and breadsticks. Plus, the flyers I got in the mail were too slick and corporate. How could I possibly like the place? The answer was in front of me: The "Stonefire Favorite" ($13.99), where wedges of California's homegrown fruit were laid out and baked on top of a thin disc of dough along with pesto, mozzarella, feta, red onions, and a garnish of snipped basil -- a creation that out-Wolfgang-Pucks Wolfgang Puck. The avocado, shriveled slightly from the heat, were intensified versions of its raw self. Still creamy, but now doubly soft, it's the difference between a just-braised pork belly and one sitting at room temperature. An herby-green pesto paste highlighted its deep, bass notes with the shrill, piercing octaves of garlic and basil. And the skinny crust was just as I liked it, playing to my belief that a pizza crust can't be too thin. If the laws of physics allowed for sauce, mozzarella, and cheese to be baked on a papadum, I'd order it. But that wasn't all that pleasantly surprised me at Stonefire Grill. The tri tip and rib combo ($14.99) came with a salad that was refreshing despite using Fritos as croutons, and breadsticks that were nicely crusted with parmesan and garlic. The meat, served on tin plate, I also liked. The tri tip was tender; the ribs lusciously porky. And both were slathered with a not-too-cloying barbecue glaze and possessed a personally coveted quality of burnt edges, where sauce and meat fuse into charred bits of flavor. Good, reasonably priced ribs and pizza from a fast-casual -- in Orange County, no less. What next? 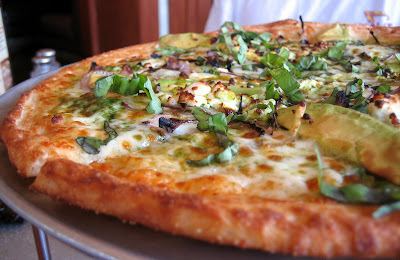 **If you've got a tip on what you think is the best pizza in O.C., please chime in. Although, I prefer thin crust, I'll take any species of pie. Unbiased recommendations only please. Mmm. I was just at Bollini's again last night. You have to check them out next time you're in the SGV. I know you come up here from time to time. Trust me, it'll be worth it. I've been unimpressed with the trip-tip at the Stonefire in Irvine lately. The last few times I've had it, it's been mushy and flavorless. The pizza is pretty consistent, though. Haha I definitely have to try that next time then. I find the Irvine Stonefire to be not as good as the Fountain Valley one, but it's right next to Tsuruhashi so I rarely ever eat at the FV one when I see the lovely Tsuruahashi. 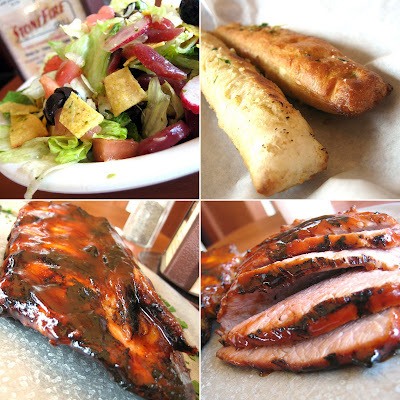 What's great about stonefire is the huge portions and the cheap price. Plus their Caeser Salad is dangerously garlicky. As for your pizza assesment of Orange COunty, how can you say that without trying Tony's Little Italy (or something like that) in Fullerton? it's great Chicago sty pizza. Bollini's. Check. I come up to the SGV for Chinese and the like, but if you say it's worth the drive, I believe you! I got lucky this time then. While I prefered the ribs over the tri tip, the two or three slices I sampled were on par with Lucille's...which in my book is a passing score. "how can you say that without trying Tony's Little Italy (or something like that) in Fullerton"
AAH! That was my thinly veiled attempt to get suggestions from people as where the best pizza is in O.C. I know I'm asking for a s***storm of debate of "mine is better than that one"...but bring it on! Tony's Little Italy. Now on my list. D'oh Elmo. I totally got the city wrong for Tony's Little Italy, it's in Placentia, which neighbors Fullerton so I'm close enough. For a good New York Slice though, I suggest Mammalucco's in Brea. Strangely both are north county. 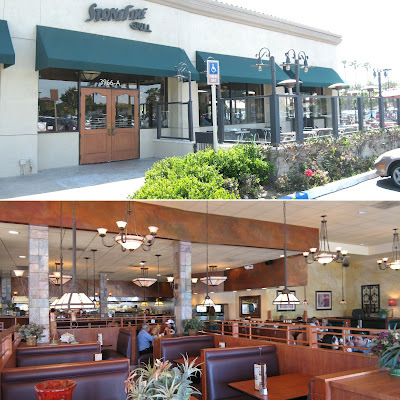 I've eaten at the Stonefire in Valencia and I was pleasantly surprised. I wasn't expecting much, but the pizza turned out pretty good. I didn't have the avocado pizza though because I'm one of those people that don't like pesto, but you do make it sound tasty. I myself just recently tried the Stone Fire in FV, and their Grilled Salad (w/ tri tip)for $6.50 (petite) is just crazy good! I mistakenly ordered a "small" the first time - yikes, the thing was huuuge! I have to go back to try the meat products , I'm having a "rib urge" as I type this! I was at Bollini's twice last week and I'm craving it again. Anyway, if you go, you must eat in b/c the Neapolitan crust really doesn't do well for take-away, especially b/c you'll be coming from so far away. Call first b/c they do close if they run out of ingredients and I'd hate for you to make the drive, only to be disappointed. Check my reviews if you want to see what the pizzas look like. I think I've got photos of almost every pizza except a few of the seafood pizzas. Tell them how far you drove to get there, they're always please to hear that. And, not to be obnoxious, but if you mention me, they'll treat you extra nice. If you don't mention me, they'll just treat you with their normal niceness. :) And just an FYI, they've recently instituted a no photos policy. If you mention you're one of my blogging friends, they might make an exception, but I'm not sure about that. And no, I'm not getting paid. I think it's the same level of devotion as what you have for Hiro, CP has for Frenzy Sushi, I have for Bollini's. Dang it I should of stop by Bollini's this weekend :-(, thanks for reminding me WC! I live in FV never really bother to stop by the Stonefire Grill I might now. That explains why I haven't gotten a good slice so far. I'm in south county! BTW, Gustavo Arellano agrees with you. He vouches for Tony's Little Italy too. Thanks for the other rec in Brea. I'm definitely going to try one of those. The one thing I didn't expect the pesto to do was leave a green pool of grease behind. Quite the opposite end of the spectrum of red pizza grease. And, hopefully, healthier! That baby back really surprised me. So much so that I actually prefer it over Burrell's...which is supposed to be a real BBQ joint. Crazy. I never thought I'd prefer a corporate-type joint over a mom-n-pop, but good ribs is good ribs. I had no idea this was your Cafe Hiro. In that case, I may take my friend (who has a birthday soon) that lives in Monterey Park there this weekend. I reread your post and man...I think this is what I've been waiting for...shame it's not in OC...Anyway, I'm still going...and It's okay that I can't take pics. I have a lot of L.A. photos in my backlog that I may never post. One of which is the new Din Tai Fung and Portos in Glendale...no sense in adding to the pile. I had no intention of trying it either. But a gift card convinced me! Glad it did though! First Class, eh? Never would've thought. I've never tried it but I think I will. I think there's one near Rite-Aid on Jamboree and Irvine, right? sounds kind of good... have you found any decent deep dish pizzas in the OC? i would be amazed. I agree, First Class Pizza is REALLY good, you should try it if you like a lot of cheese on your pizza. There's a Johnnie's New York Pizza opening at Orchard Hills soon - I've never had it (it looks like it might be a chain) so I'd be interested in hearing your thoughts once it opens. I haven't been there for awhile, but if you in the west Anaheim area and like stuffed crust pizza, you can try Sals Bit Of Italy. Any food is made better with avocado, in my opinion. Especially dessert. There should be more places in OC with avocado desserts! As a transplanted New Yorker, I can be a bit picky about my pie. I've tried a number of places in the OC and have to say that thus far, Ma Rizza's in Long Beach is my favorite. You should give it a shot sometime. I LOVE THEIR TRI TIP! They also do a great job catering. I checked out your blog! Very nice. Especially your title! The only deep dish I've had in OC is from BJs...not bad, but not great either. But then, I'm not much of a fan of deep dish. Thin crust forever! OR at least whenever possible. Whoa! Thanks for the tip on Johnny's. Although it's within a block or so from where I live, I rarely visit Orchard Hills. I will check it out to see of its progress. And that's two votes from First Class. I had no idea! Sal's Bit of Italy. Check. But stuffed crust? I thought that was a Pizza Hut invention. Totally with you on that. Though I know of a few places that does avocado shakes! Lee's Sandwiches in Irvine for one. Delish! Wow a blessing from a New Yorker! Long Beach is a schlep...but it's on my list now for sure since you've given it your thumbs up. They do seem very customer oriented. Very refreshing. And guess what Elmo? Paris Baguette is open in ZION!!!! They made it into a mini cafe providing fresh bakery starting around 10AM. Go enjoy yourself! Don't bother with First Class Pizza..just a step,albeit a small one, above Pizza Hut....instead try the pie at Al's Cafe in Irvine. Best pizza in OC is probably Sonny's in San Clemente. Very thin, crackery crust, well charred at the edges. Good sauce. It's a hike from Irvine but worth the trip IMHO. Also try Original Pizza down on Newport peninsula. It's right there in the McFadden Square area near the Newport Pier. It's pretty good. Just wanted to say I REALLY value your blog. I'm a UCI alum, and now work in Irvine, so I'm always looking for new places to eat, and you sir have opened me eyes to a many places. Thanks again! Hmm... Never been there. I guess this is a new place for me to try. I have been getting thin crust pizza from Quattro Cafe. That's great news about Paris. I'll definitely give it a shot! Thanks! I checked out Al's website and it does look good! You had me at "thin, crackery" and cinched it with "well charred". But yeah, a drive, but still in OC, so that's good! I'm glad you are liking it! Hope the blog continues to inform. I've been to Quattro. But just to get a drink. Next time I'm stuck at the mall, I'll have to remember they have pizza. Thanks! Love your blog, especially all the props to Tustin eateries. If you're looking for great New York-style pizza, try Roma d'Italia in Tustin. Roma D's is great for a meal and their pizza bread addictive, but for actual pizza Renato's on Brookhurst and McFadden is the only place I go. The chef from the old Emelia's on First St. is there. And I was conceived and born in Brooklyn and raised on Long Island, I know my pizza. Great blog, great to have people promoting local food, local businesses, and ultimately our local tax base. I've completely cut out chain and franchise restaurants from my mix.